Italian-American Cascone (Mother’s Little Helper, 1986, etc.) 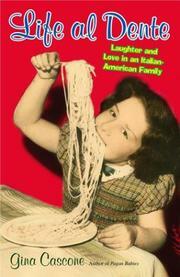 pays affectionate tribute to her heritage as she recalls growing up among relatives determined to live life con brio. In chapters that chronicle the various highlights of her youth, the author begins by recalling how her father adjusted to her being a girl. Though this successful lawyer had expected his firstborn to be a son, he soon decided that even a daughter should not grow up to be one of those “silly ladies.” He taught Cascone to stand up for herself, fight back when attacked, and never to back down. When the boys no longer allowed her to join their baseball games, her father taught her pool. Soon, to his delight, she was not only beating the local adolescent males but her father’s friends too. When a neighbor complained that Gina was playing pool for money, her mother initially forbid her to “hustle,” but upon learning that she was actually beating the men encouraged her to “clean them out.” Cascone recalls her reluctant move from their friendly city neighborhood to a big, new house in the less welcoming suburbs. Daddy sent her to a WASP prep school; her classmates ignored her until they saw her family at a school play and rumors began to circulate that they belonged to the Mafia. Cascone, deciding she might as well be a mob princess, played the role to the hilt. She recalls other memorable episodes: the Christmas her father resolved to have eels for dinner and stored them, alive, in the bathtub; their sentimental visit to Italy, where every meal seemed a celebration; her first encounter with the WASP Prince Charming she eventually married, though never sure whether it was her or the food that kept him coming back. A rare and refreshing tribute to a happy and wonderfully exuberant family.